ANAHEIM, Calif. – Albert Pujols circled the bases without showing much emotion after hitting his long-awaited first home run for the Angels – same as he did 445 times with the St. Louis Cardinals. But when he returned to the dugout, he had it all to himself. There was nobody home. No players, no coaches, no batboys. Pujols’ teammates gave him the silent treatment, a plot hatched by outfielder Torii Hunter. They were all waiting for the slugger in the tunnel leading to the clubhouse. Then, a burst of euphoria and they were all back on the bench, high-fiving and slapping him all over his body. The reception was fun for just about everyone after Pujols’ two-run shot, which helped Los Angeles beat the Toronto Blue Jays 4-3 on Sunday. Pujols drove a 2-2 pitch by Drew Hutchison (1-1) into the left-field bullpen for a 4-1 lead in the fifth inning. The three-time National League Most Valuable Player had gone 33 games and 139 at-bats dating to last year without a home run during the regular season. He had a three-homer game for St. Louis in the World Series and hit seven home runs in spring training. The slugger did not play in Saturday night’s 6-2 victory after Angels manager Mike Scioscia kept him out of the lineup for the first time. Pujols had not homered during the regular season since Sept. 22. This was the first time Pujols, who began the game batting .194 with five RBIs, drove in a run with a hit since April 15. His longest home run drought prior to this was in 2011, when he came up empty in 27 straight games and 105 at-bats. 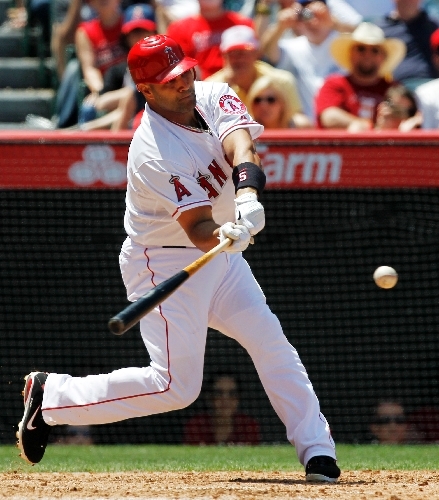 ■ KEY: Albert Pujols snapped the longest home run drought of his career with a two-run shot in the fifth.